All real estate agents must work under a real estate broker's license. A real estate agent license does not allow an agent to work independently. People who want to work independently often go for a real estate broker's license and not a real estate agent salesperson license. This is why a broker retains part of agent's commission or, in some instances, charges the agent a desk fee. It's a cost of doing business for the agent. A desk fee is part of a payment agreement between a real estate agent and her or his broker. 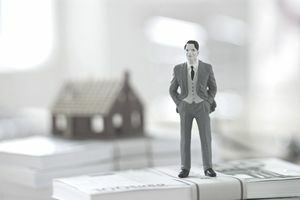 It is an alternative model to splitting the commission between the agent and the broker, or they may agree to a combination of desk fee and commission split. A desk fee is charged by the broker monthly, nominally for providing office space and a desk for the agent. It may not be the only fee charged by the broker. It is common for real estate agents to pay their employing brokers a desk fee when the broker agrees to give the real estate agent 100% of the commission earned by the brokerage on behalf of the agent's efforts. How Much Are Desk Fees? Desk fees vary but are generally a flat fee, an agreed upon rate for operating either in the broker's office or under the broker's license or both. They may be higher or lower if an agent wants a private office or if they work from home and do not have a physical desk at the broker's office. Real estate brokers are responsible for the actions of their respective real estate agents. Desk fees do not alleviate a real estate broker of responsibility. Some desk fees paid by agents to their brokers are capped at a maximum amount so once the agent has paid in X amount over the year, the broker is not entitled to any more money for the remainder of the year. The broker earns income from the actions of the agents through either fees or commissions. This money is needed to defray the costs of the office space, office operations, office staff, advertising, insurance, computers, website, internet, telephones, affiliation costs, licensing and many other expenses. Once you have more frequent sales, a desk fee can look like a bargain compared with splitting commissions. This may pencil out in a hot real estate market where commissions are adding up. You may want to look for a broker who offers both models or combinations of desk fee and commission split. Then you can renegotiate or switch models with the same broker. If that is not available, you may begin to look for a different broker to sign with depending on the market and your ability to close sales. There are many other factors in determining which broker you should sign with, but the fee structure is one element to consider. Is It Worth It to Change Brokers for a Better Commission Rate? Some brokers offer wildly attractive desk fee packages to lure agents from one firm to another. The brokerages might throw in other perks such as free For Sale signs, free business cards or access to certain types of technology without a cost. These perks might have an expiration date, though. If something sounds too good to be true, it might be true for only a few years. Ask before switching brokerages about company policy. Moving from one brokerage to another broker is costly and often wastes a lot of time that could be spent instead selling real estate and earning an income. Changing brokers can be confusing to your clients as well. There is more to life than money.